Crested ducks are a personal fave of ours here at Ekcentric. 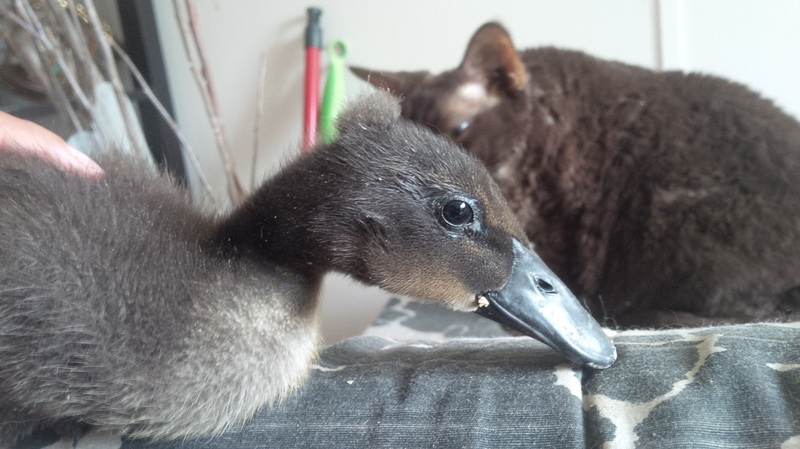 Our Crested ducks come in a variety of colours and do not conform to any standard. 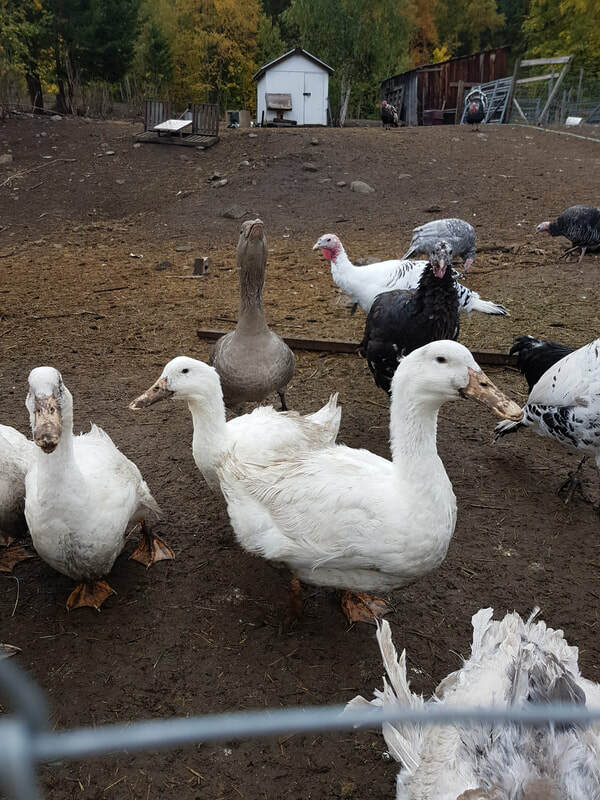 Ours are generally bread loaf shaped and have adorable crops that swing infront of them. 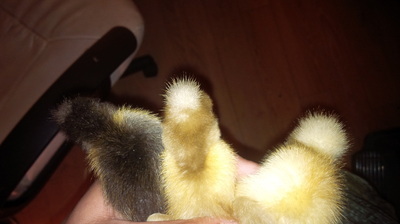 They are just fun mixes that we enjoy creating and watching run around with their adorable pom poms. We do not recommend breeding crested to crested as the crested gene is lethal in double doses. 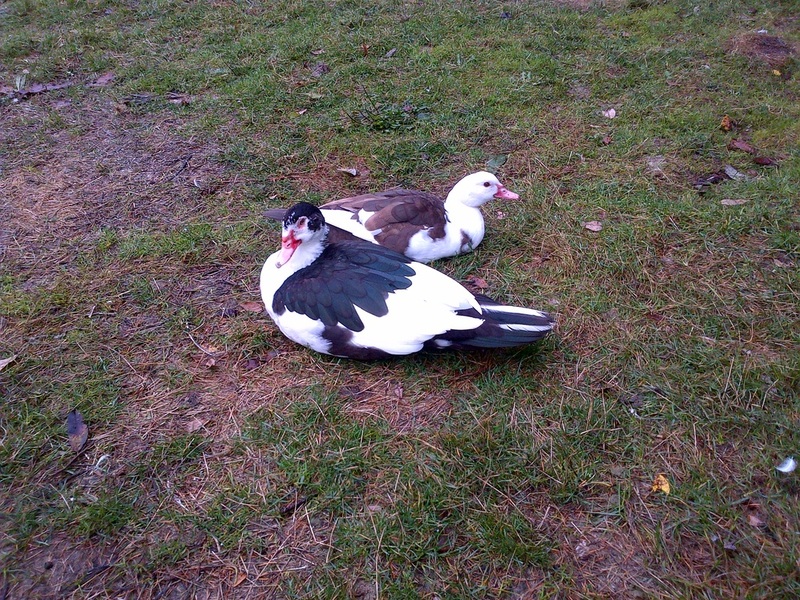 Magpie ducks come in black, blue, and chocolate with white sports. 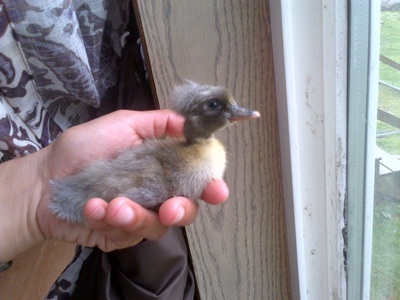 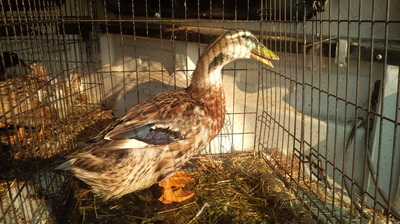 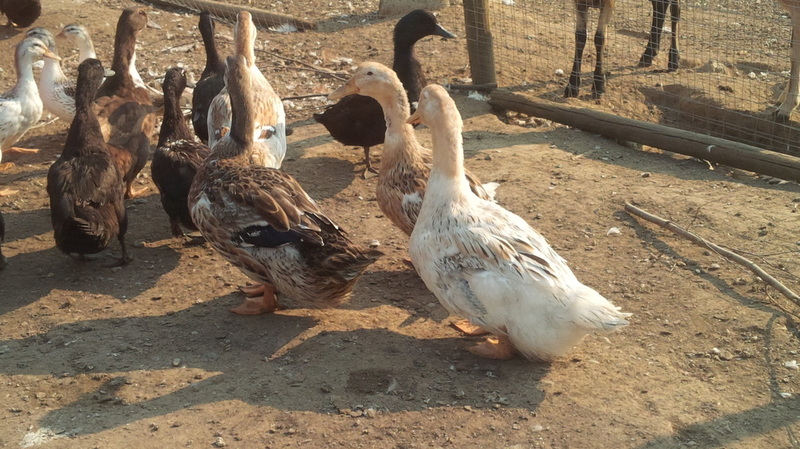 They are a light weight duck that are suitable for both egg laying and show. We have been very lucky to acquire stock with great markings. 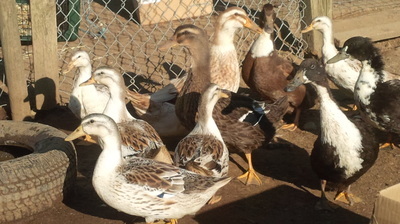 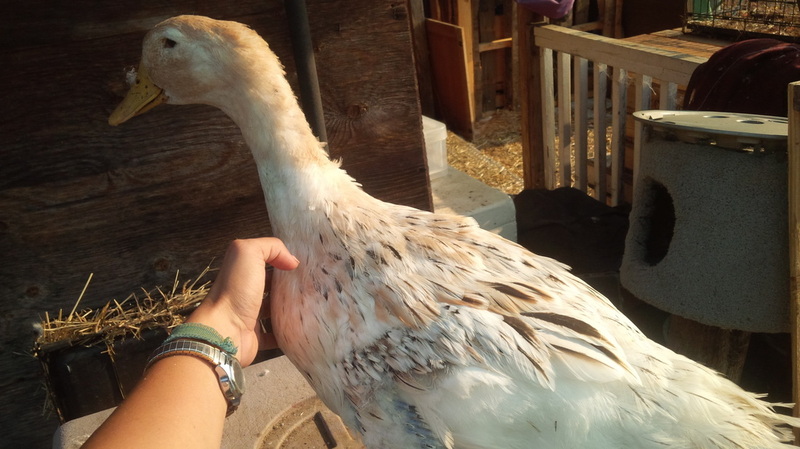 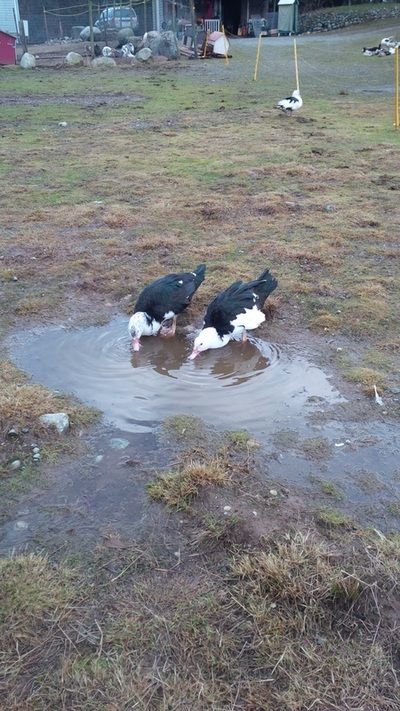 We consider these ducks to extremely attractive with their distinctive markings. 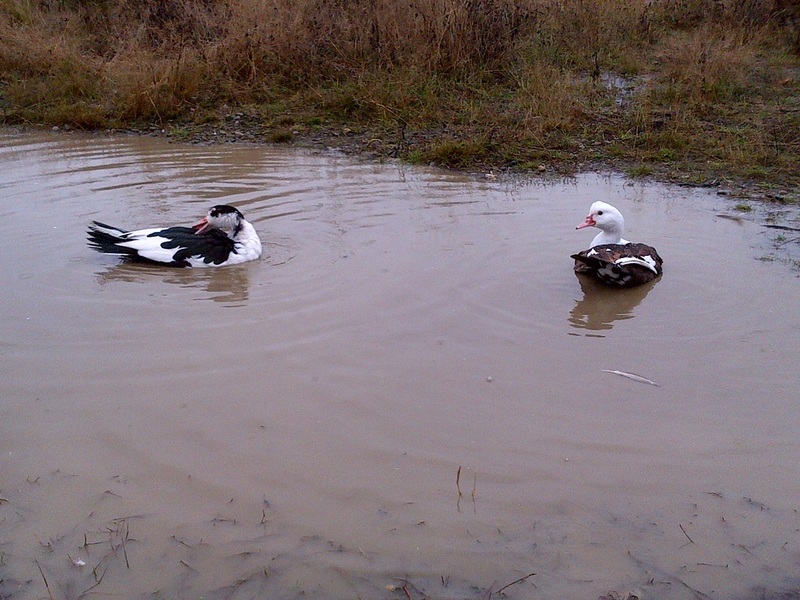 Our Magpies are inoffensive ducks with a more upright carriage than our Crested due to their runner duck heritage. They will forage for part of their diet and are quieter than our other breeds. 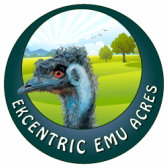 Update: We no longer work with Magpies, but would love to acquire stock again. Dutch Hookbills are a rare heritage breed of duck that is currently not recognized by the APA, but is recognized in the UK. 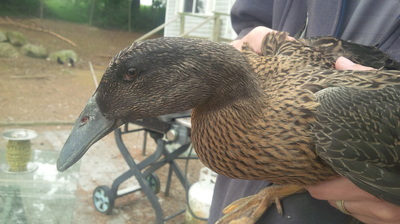 They have a distinctive curved beak. 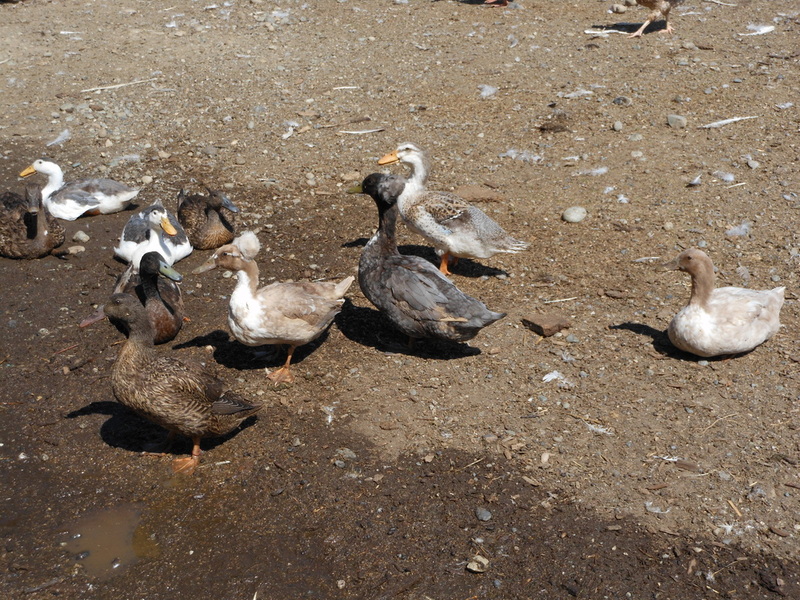 There are extreme beaks, moderate beaks and straight beaks. 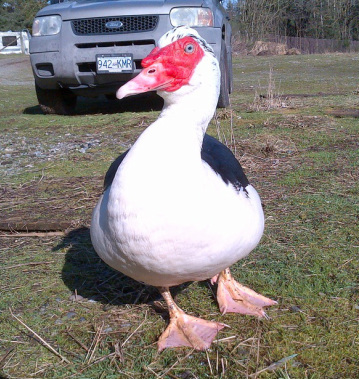 Ours are moderate to straight, but we hope to produce extreme beaked Dutch Hookbills. 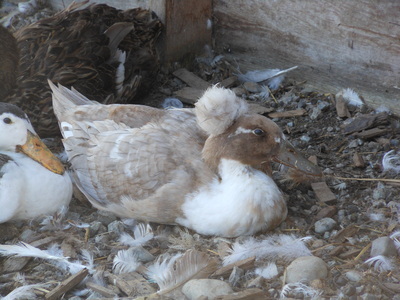 These ducks are a light weight egg laying breed with excellent foraging skills. 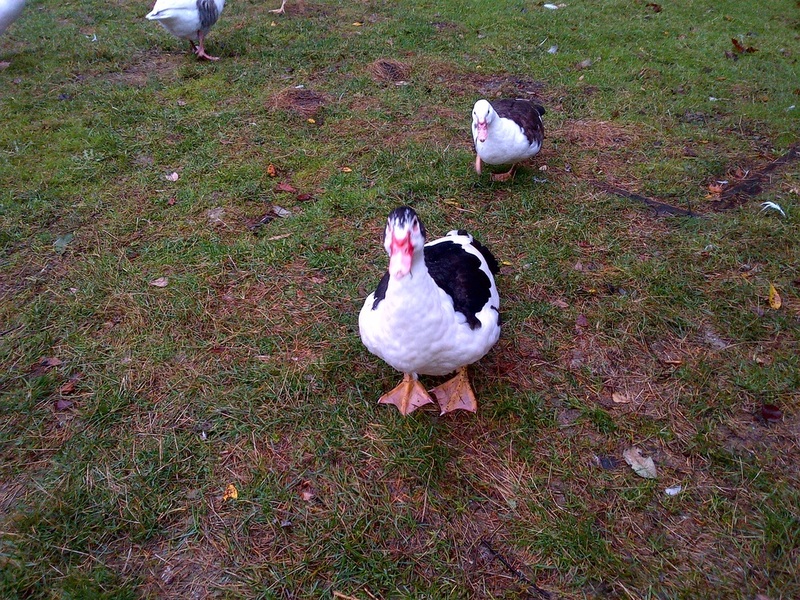 Our flock are active little guys constantly moving about. 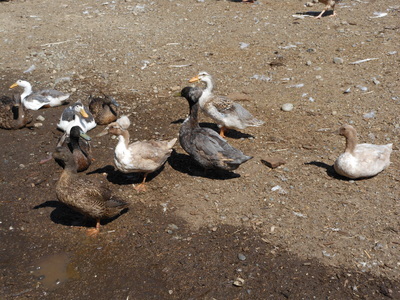 They are dark coloured birds that blend in very well with the landscape. Update: Our Dutch Hookbills have moved to a nearby farm! Silver Appleyard ducks are an extremely rare breed of heavy weight duck. 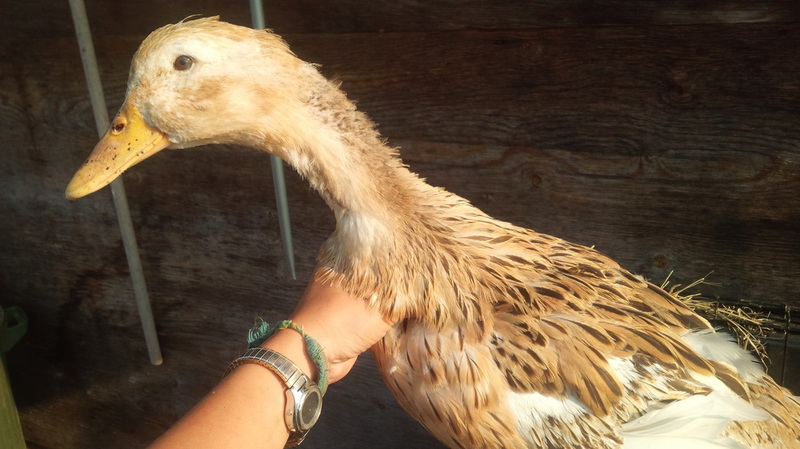 They are an excellent meat and egg breed. 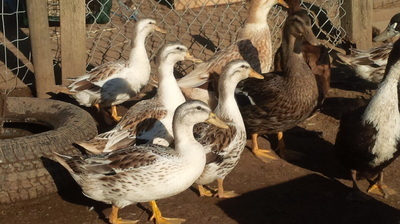 They are a beautiful duck with gorgeous colour and markings. 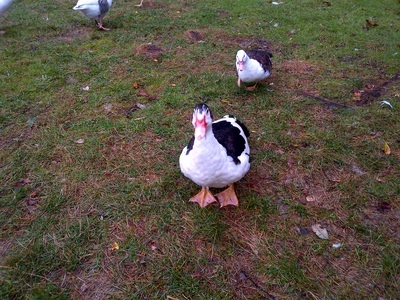 Our ducks are very large and extremely comical to watch waddle about because of their blocky shape! 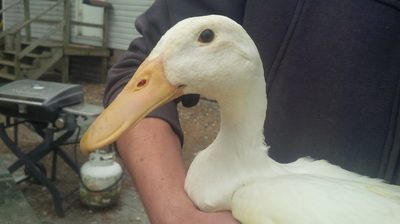 They are calm and easy to handle which makes them a joy to have on the farm. 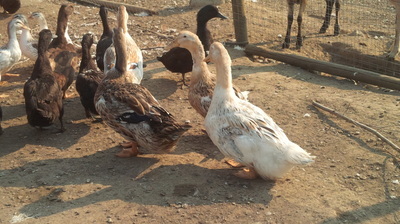 Due to their placid nature, robustness and beauty they are an excellent pet. Our miniature Silver Appleyards are more like mini Silver Appleyard look a likes. 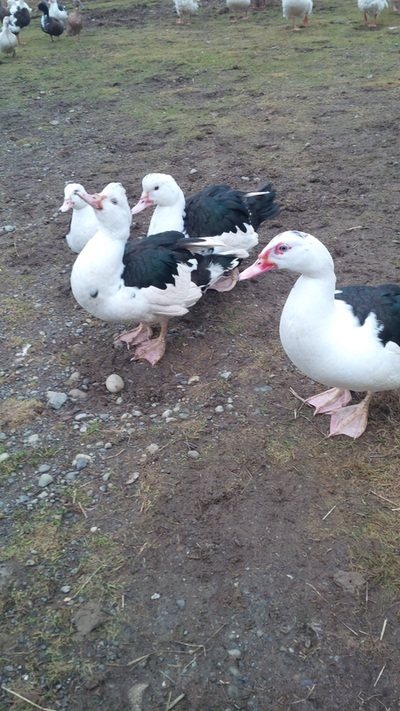 Genetically they are different from Dave Holderread's mini Silver Appleyards (which are really Silver bantams) and visually are closer to true Silver Appleyards found in the UK. 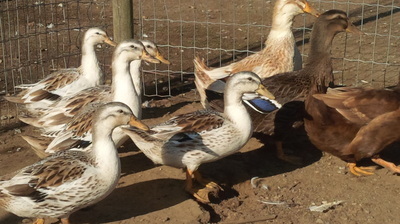 Our mini's were derived from Call duck stock and do not conform to any standard, but are just super cute little ducks in a colouration we find gorgeous. 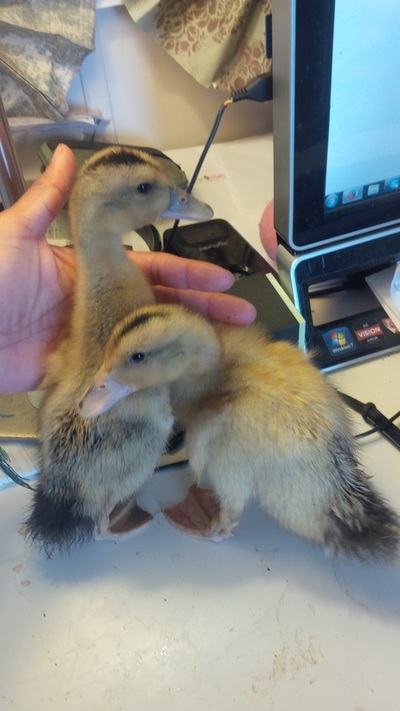 They are 1/3 the size of our larger Silver Appleyards. 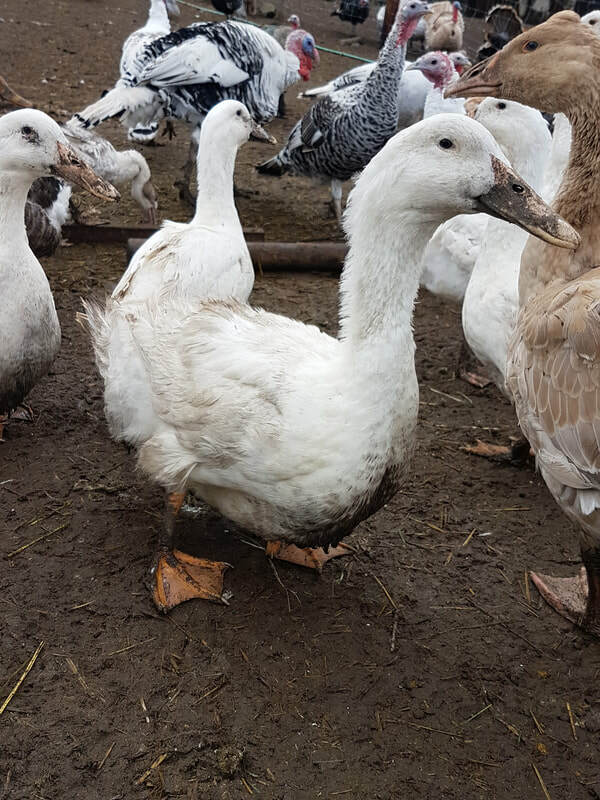 We found this flock at a local breeder and we're very excited to work with them and offer them to others. 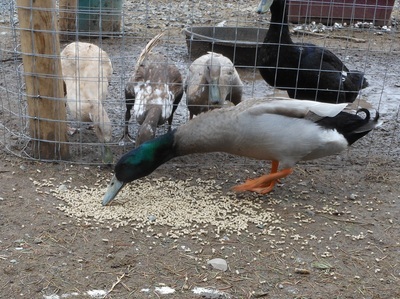 Update: Our mini Silver Appleyards can now be found at The Egg and Horseshoe Farm in Pritchard. Muscovy ducks are a duck of a different type! They are not a Mallard derived breed like the breeds above and are a different genus and species. 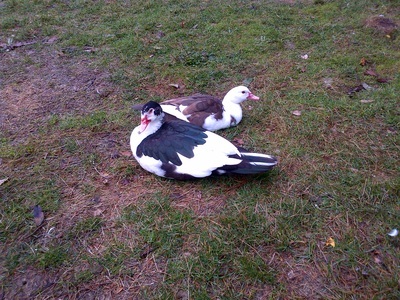 Crosses of Muscovy to Mallard ducks produced "mule" or sterile ducks. 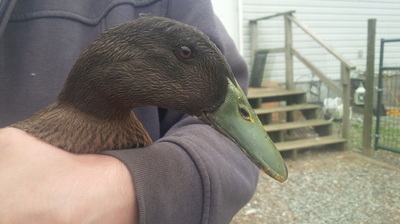 These ducks are perching ducks with strong legs and big claws that still manage to fly, at least the smaller females do. 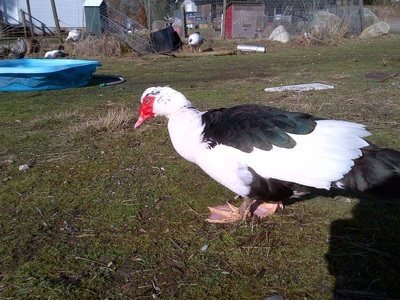 Domestic Muscovy males get too big to fly, but we have seen males fly at low heights. These ducks have very distinctive faces and are wonderful mothers that brood and raise their own babies. They can be incredibly friendly in our experience, but males can imprint on people and become sexual aggressive in the breeding season. 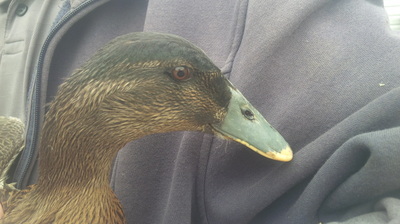 We keep them because they are excellent fly catchers and it is our hope that they will become are main meat bird. 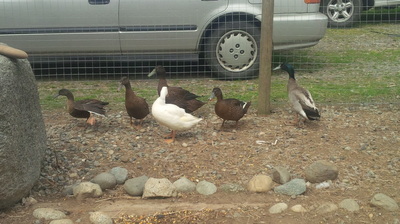 They come in a wide variety of colours and are fun to watch with their wagging tails and bobbing heads. We currently have Muscovy in black, blue and chocolate. Our favourite colour is pure black with gypsy face (black caruncles). 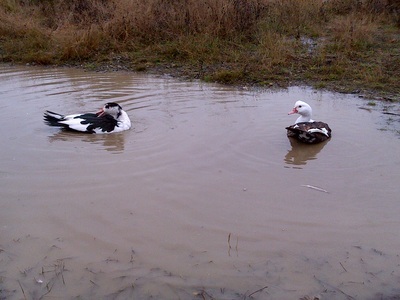 We are super excited about adding Aylesbury ducks to the farm! 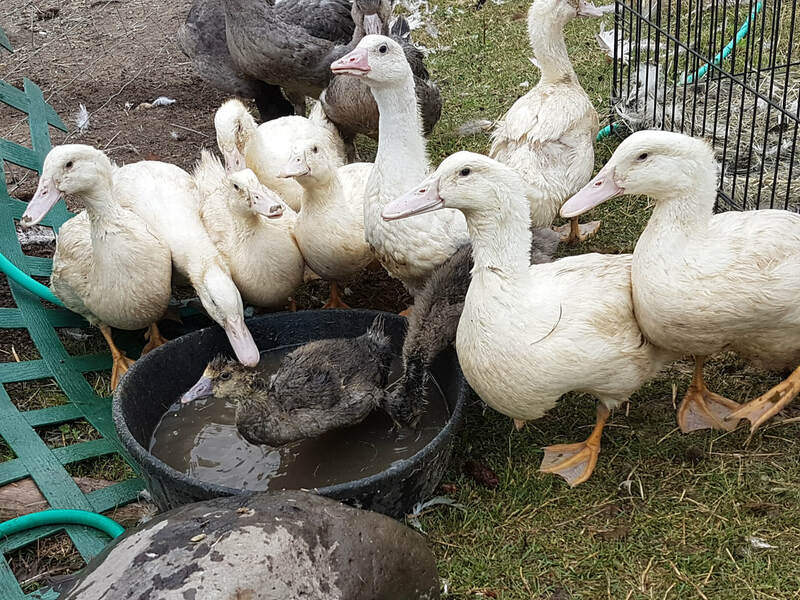 We were able to purchase 8 ducklings of which we have 5 males and 3 females to build a small flock of these very rare heavy breed ducks. 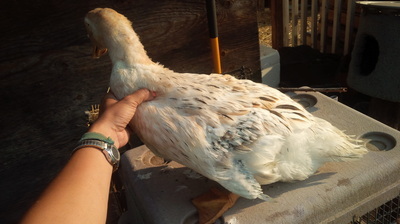 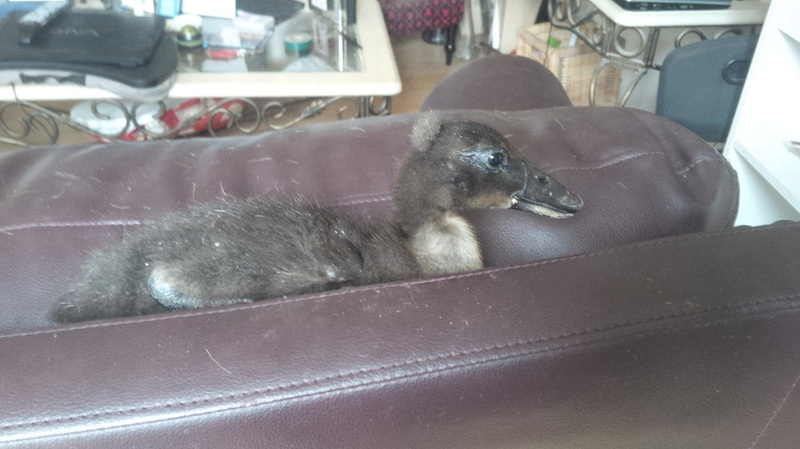 Aylesbury are nearly non-existent in Canada with very few breeders with these comically heavy ducks!